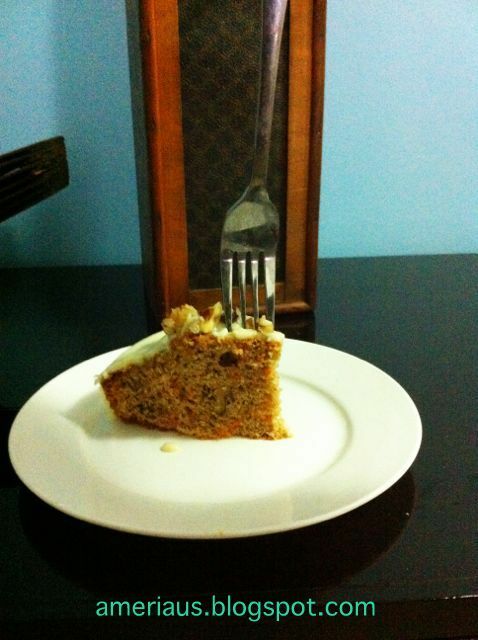 I made a nice carrot cake last night! It was my first time making the cake and I was a little nervous about how it would turn out because I fail at baking. Every time I bake a cake it always ends up to dry or not flaky enough but this time I am happy to say that was not the case. :) I nailed it. I know it was good because my partner asked me to please pack him a slice for lunch today! He's not a big sweets fan like myself but he did tell me that he enjoys a nice carrot cake with buttery, cream cheese icing so I decided to give it a try. Preheat oven to 180. In a large mixing bowl pour oil and brown sugar and mix until thick. Add eggs one at a time and mix. 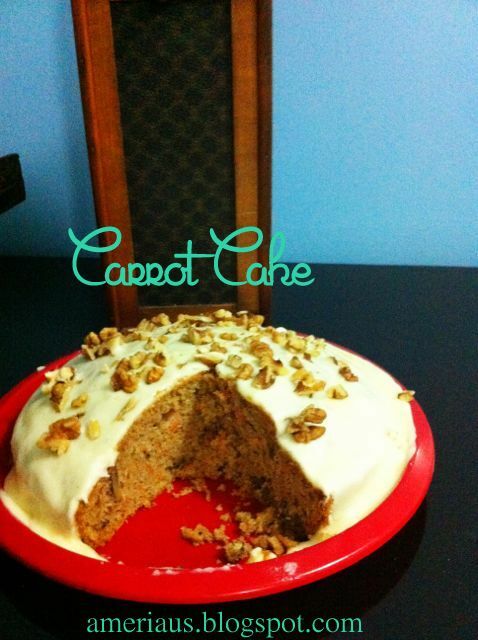 Pour in your flour and seasonings (nutmeg, salt, cinnamon), bicarb soda , carrot, and 1 cup of chopped walnuts. Mix well and pour into greased baking pan. Cook for 35-45 minutes. Remove cake and allow to cool. Run knife along the sides of the pan to loosen the cake. Turn the tin upside down and shake until the cake falls out. Be careful so that the cake stays in tact. Now it's time to make the icing! Simply take a bowl add your butter, icing sugar, and cream cheese. And blend until smooth. It icing is to runny add more icing sugar until its thick enough. Pour icing over the top of the cake and smooth around with a spoon. Sprinkle with walnuts and allow to sit in the fridge overnight. Serve! As always let me know what you think with a + and/or a comment :) Thanks guys!